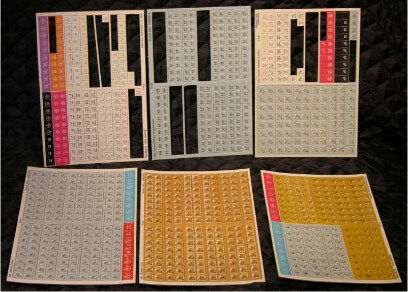 1st Edition: 4 8"x22" mounted mapboards (20-23); 12 countersheets (1430 1/2" counters; 966 5/8" counters); 10 scenarios, dice. 2nd Edition: Same as 1st Edition, plus the complete Red Barricades contents. Slight changes in countermix, mostly information counters. 3rd Edition: 10 8" x 22" cardstock mapboards (1-5, 8, 20-23); 14 countersheets, 24 scenarios (1-10, 123-136), dice. The extra scenarios are reprints of scenarios from ASL Annuals and The General. Note that the Third Edition NO LONGER contains Red Barricades. 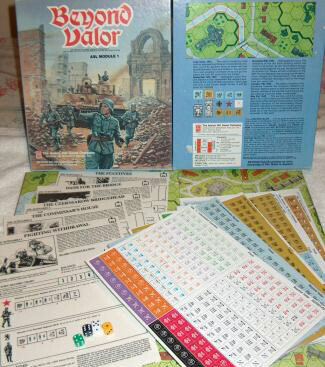 Beyond Valor is the core ASL game module, primarily because it contains the entire German and Russian Orders of Battle. The four maps that come with the module are urban maps; however, some of the scenarios assume the ownership of boards from the original Squad Leader and its gamettes (specifically, Boards 1 and 8). The 10 scenarios represent a variety of actions, and include some genuine classics, such as “Fighting Withdrawal.” However, by today’s standards, many of the scenarios are very large in size and length and are not played as much as they used to be. Beyond Valor also contains the basic informational/status counters needed to play the game, as well as counters representing Finnish troops and Partisans (though not complete OBs for either). 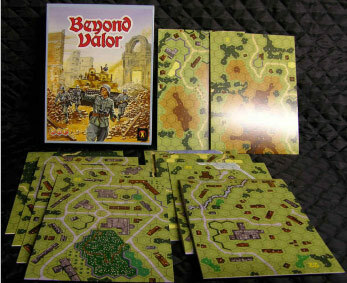 Beyond Valor was the first ASL product to appear, debuting at the 1985 Origins gaming convention on June 27, 1985. However, no one could play it, as the ASL rulebook would not come out until the end of the year, due to delays in composition and playtesting. 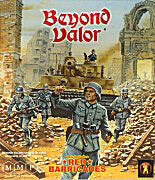 After MMP assumed control of the ASL license from Hasbro, they published a 2nd Edition of Beyond Valor, which by then was long out of print. The 2nd Edition Beyond Valor was a true value, containing all of the contents of the original Beyond Valor (although the Finnish counters were now gray instead of blue) and, as an incredible bonus, the entire HASL module Red Barricades, the most popular HASL. The 2nd Edition quickly went out of print and sells for a dear price on E-bay. 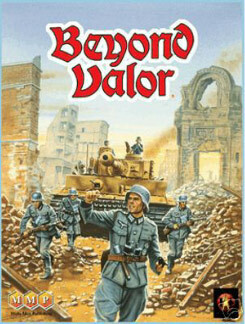 In 2004, MMP announced that they would print a 3rd Edition Beyond Valor. This edition would not have Red Barricades included with it, but would include 10 mapboards (of the semi-mounted “new style” of the ASL Starter Kit) and a large scenario mix different from that in the 1st and 2nd editions. It appeared in early 2006. Though it no longer contains Red Barricades, it too is a value, due to the large number of maps and scenarios, although it should be noted that 12 of the 14 extra scenarios are conversions of old Squad Leader scenarios, not all of which were necessarily good scenarios. However, the two other scenarios included, 135 (Acts of Defiance) and 126 (Commando Schenke), are good scenarios. The “new style” mapboards, which are not printed on paper and glued to cardboard (i.e., mounted) but rather printed directly onto cardstock, were originally somewhat controversial. The art on the new Beyond Valor maps is not the original ASL art, but has been redrawn with computer graphics (the original artwork no longer exists, so some sort of recreation was necessary). Some people like the crisper graphics better, while others prefer the original artwork. One thing that is definitely true is that the new maps have fewer printing irregularities than the old maps, so the quality control is much better. The most controversial aspect of the newer maps is the fact that they are on cardstock rather than cardboard. While this was dictated by the rising cost of mounted mapboards, which were becoming prohibitively expensive, many ASLers dislike them greatly, while others either prefer them or at least have no real complaint about them. The detractors view them as of lower quality and less durable. Some also view them as “incompatible” with older maps because they are thinner (and thus there is a slight height difference between old and new maps), although this complaint does not have much merit. Cardstock maps by other wargaming companies in the past suggest that although they are typically not as durable as mounted maps, they are nevertheless quite durable if treated well. 2013 Update: After some years of the “new style” maps, most ASLers have become accustomed to them. You have omitted mention of the 2016 reprint of the 3rd edition. While being largely identical to the previous release, some minor errors in the counters were corrected, and the numerous blank counters from the previous printing were repurposed to provide additional markers of various types. Scenarios, boards etc. are identical.